It’s been a while since I’ve run any guest strips on this site, and this one from Charles Arrington is a fantastic way to bring them back! I love everything about this strip – the cartooning, the colors, and especially the concept. Not only am I thrilled by the dream within a dream within a dream happening Inception-style here, but gamers will note that jefbot’s in Subcon, the dream world from Super Mario Bros. 2 (and yes, I know about its roots as Doki-Doki Panic but it’s still one of my favorites.) Just way, way cool. 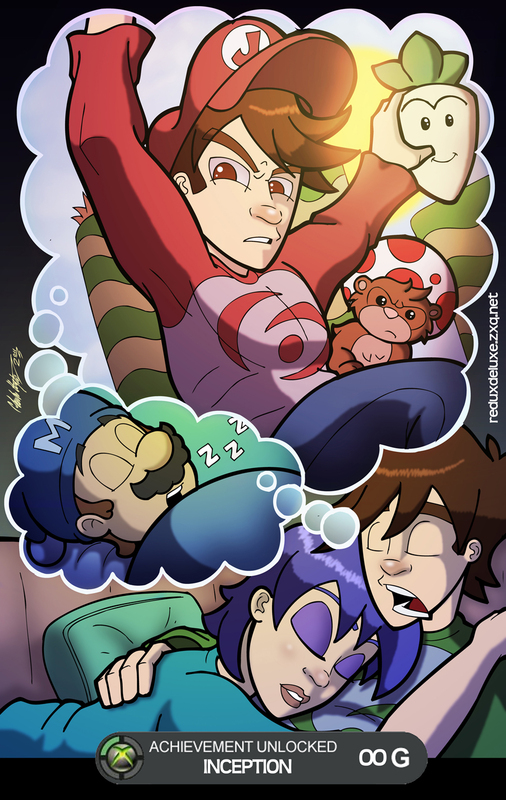 Love the expressions throughout, jefbot’s delusion of Mario-esque grandeur, and cel and bot snoozing on the couch, which just caps the whole thing off with a nice touch. Great stuff! Thanks, Charles, I couldn’t be happier leaving the site in your capable hands while I’m in the midst of getting ready for Seattle’s Emerald City Comicon which is happening later this week! (I’ll be posting a progress update soon.) And JEFbot peeps, go check out Charles’s cool “work in progress graphic novel” Redux Deluxe for more awesome-y goodness! P.S. If you’d like to help me out with a guest strip while I’m away at the Comicon, email me here. Looks awesome. Have fun at the con! And apparently I can’t even click the right ‘reply’ button. Haha! Awesome guest work! Enjoy the con! One day I will be out there for an East coast invasion of a West Coast Con!! Awesome guest strip! And it even references SMB 2! Good times! My Netbook screen revealed each layer, top to bottom—very nice effect! And for some reason, seeing ‘bot sleeping with his mouth open makes me grin. Awwwwwwwwwwww. Snugglie cel and Jeff….ADORKABLE! This comic is amazing. Bravo to the artist. Can’t wait to see what happens at the con for you Jeff dahhhhhlink. OMG that was adorable!! Thank you Charles!! Good luck ‘bot!!! I hope it’s quite profitable and a great learning experience!!! Very cool guest strip, Charles! Can I just tell you how fabulously cute your Musashi is? And thanks for coming to Jeff’s aid while he is in the midst of frantic-ness! That is RAD! Awesome guest strip. And Jefbot, congrats on your first book!!! Rock it out in Seattle! Aww thanks for the kind words everybody. And it was my pleasure to help you out Jeff! Have a great time at ECCC! I must Rofl till i die now. I LOVE THIS!!! I’m in aaawwww. This needs to be Obama’s campaign poster for 2012.
its been a while since i last came here, and is that a new art change?